Several pieces of software came to my attention just recently; all four of them published by the practically unheard of ‘Fresh Devices’ company and available completely free of charge from www.freshdevices.com.I spent an hour this afternoon trying them out and thought they were worthy of inclusion in Click. 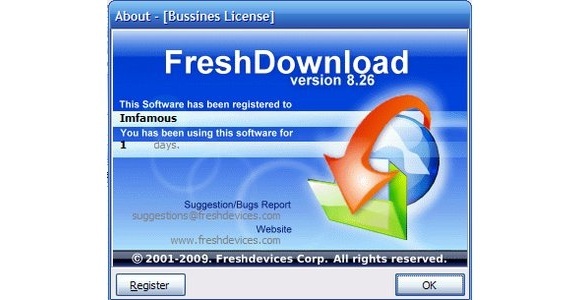 Fresh Download is a download manager that replaces the bog standard file downloader built in to your existing browser.It supports opening multiple connections to decrease download times off slower websites, includes the ability to pause downloads as well as resuming those that failed part way through.The program is easy to use and can be integrated with either Internet Explorer, Firefox, Opera and many other browsers that work in any version of the Windows Operating System. Fresh Diagnose is used to analyze and benchmark many kinds of different hardware in your machine in order to gain more information about a specific component or to measure its speed.Benchmarks can be performed on practically any part of your system such as your processor, hard disk, memory or alternatively it can be used to give you an overall impression as to how fast your computer is running and how this compares against other machines. Fresh UI is a tool designed to configure and optimise Windows.Once you’ve installed the software you will be able to change hundreds of hidden settings not usually accessible from within Windows itself from within what looks like a simplified version of Windows Explorer.You’re offered a variety of areas of the system that you would like to alter which include Applications, Explorer, Hardware, Windows System, Windows Interface and Covering Your Track.Within each of these categories are a huge number of different settings that can be easily changed to suit your personal preferences. The majority of settings you’ll probably want to leave at the default settings but I can guarantee that everyone will have one little grumble with Windows that they would change if they had this utility installed on their machines. Fresh View is a utility which allows you to organise and view images, audio and video present on your system – you can use it to listen to music or to view pictures and movies saved in practically any format.There are dozens of other programs that perform this function at least as well as Fresh View it is still worth a look due to its small file size and simplistic interface. I’ll be honest with you in saying that none of these programs are going to change the world and for the most part each one of these utilities covers ground that has been walked a thousand times before.Having said that however I would still urge you to give them a go as each utility is well designed, easy to use, small in size and accomplishes exactly what it says on the tin – nothing more, nothing less..